I don’t really ever upgrade my games by adding cooler components or by painting minis or anything like that. But every once in a while there is a product that can add enough to the game to make it worth it. Today I want to introduce you to Meeple Source. I wrote about Meeple Source in my Sourcing Game Components: Meeples article last September. They make fantastic custom meeples with a ton of character. Today I am mentioning them because they have a campaign currently running on Kickstarter (KS Link). I have personally met the fine folks behind Meeple Source and they are great people with a great product. They just look so awesome! 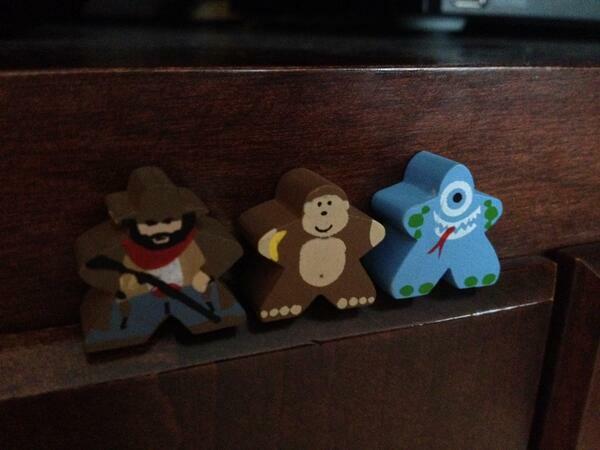 I brought back a few of the character meeples from BGG.Con and my kids (ages 4 and 2) loved them. I wish I had bought more of them for my kids, and for my own games and game designs. The campaign they are running has ten days remaining. They are over $70,000 and they have more stretch goals to go. So far they have added some awesome stuff to the campaign. They added custom character meeples for a few games, like Tiny Epic Kingdoms, Lords of Waterdeep and Pandemic. They have three custom meeples from other companies like Miniature Market, Board Game Geek, and Tasty Minstrel Games. These are free to people who pledge $9 or more. They have also added cool viruses, germs, or plagues for Pandemic. I won’t get into the pledge tiers for the campaign because there are a ton of them. But go check it out and choose some sweet character meeples for yourself, or your kids, or your parents, or to hide in your co-workers office. I’m backing to get a fresh set of 10 different meeples, but since they keep adding awesome content I have no idea which 10 I’ll choose in the end. Posted on March 6, 2014, in Kickstarter, The Boards and tagged awesome, board games, Character Meeples, kickstarter, Meeple Source, meeples. Bookmark the permalink. 1 Comment.